The school board vote was simple, but the matter is far more complex, drawing a focus to an issue many within LA Unified find uncomfortable to talk about: classism. 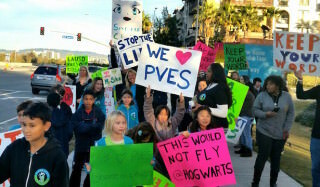 The issues involved in the Playa Vista Elementary School dispute are a microcosm of complexities within the second largest school district in the country. They involve noise and air pollution, freeways and airports, pitting charter schools with traditional public schools, school over-crowding, district budget cuts and an increase in demand to teach the students’ parents in an ever-growing adult education program at LAUSD. And, it also involves classism: With the area in question a part of Los Angeles that includes million dollar beach houses and families with yachts as well as some of the most notorious gang-infested housing projects in the city, where do children go to school? The friction began when Playa Vista Elementary opened in 2012, offering a highly-regarded STEM program for kindergarten through fifth grades. It had 26 classrooms at the time but has now grown to 540 students with no more space available. New housing under construction nearby suggests that by 2020, the school will need to accommodate 400 more students in 14 more classrooms. A proposal will move fourth and fifth graders from Playa Vista to Wright Middle School by the 2016-2017 school year. Wright also has 19 classrooms on campus for the Westside Innovative School House charter elementary school (WISH). The district is looking for a new home for the charter classes and is considering renovating the adult school at Emerson, which was originally built as an elementary school. The school board voted to conduct a feasibility study to see about locating the charter school at the Westchester-Emerson Community Adult School and upgrading Wright’s science lab, as it seeks to deal with increasing enrollment at the local schools — one of the only areas in Los Angeles where enrollment is burgeoning. Underlying any final decision are issues of diversity. School board president Steve Zimmer, whose district includes these and nine feeder schools, said he apologized for past miscommunications about solutions but cautioned all sides of the issues to approach solutions in a respectful manner. Board member Mónica Ratliff questioned why WISH was getting preferential treatment about the move, and she said she didn’t like the idea of turning an adult school into a charter school. Cortines said he toured the campuses on several occasions to figure out what works best. 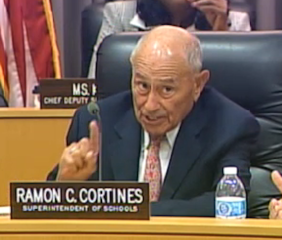 He said that adult education is expanding, and there is a waiting list of 16,000 for some LAUSD programs. The school board voted (with Ratliff against) to add four classrooms at Playa Vista and to renovate up to five existing classrooms at Wright to create flexible learning/science labs and study the viability of sites and possible relocation of the Emerson adult school.